Vickie offers her clients a competitive edge by staying abreast of the latest in technology and market trends. A lifelong resident of the Randolph, Vickie has established herself as the number one producing agent in Randolph County. She is a consistent winner of industry awards, including being inducted into the RE/MAX Hall of Fame. Vickie Gallimore began her long and successful real estate career with RE/MAX in 1989. Vickie was successful from the offset, and immediately took 1st place in the market share of her market area. For this monumental effort, Vickie Gallimore was named Broker/Owner of the Year with RE/MAX in 1989. Once again, Vickie was recognized for her success when she was chosen by her peers as Randolph County Realtor of the Year in 1996. Vickie is a high achiever, consistently ranking in the Top 20 agents within North & South Carolina. Most recently Vickie has been lauded for her efforts by receiving the Distinguished Service Award in 2003 and being inducted into ReMax's Circle of Legends in 2008 with an Award that recognizes her achievement of the highest level of production and service within the organization. 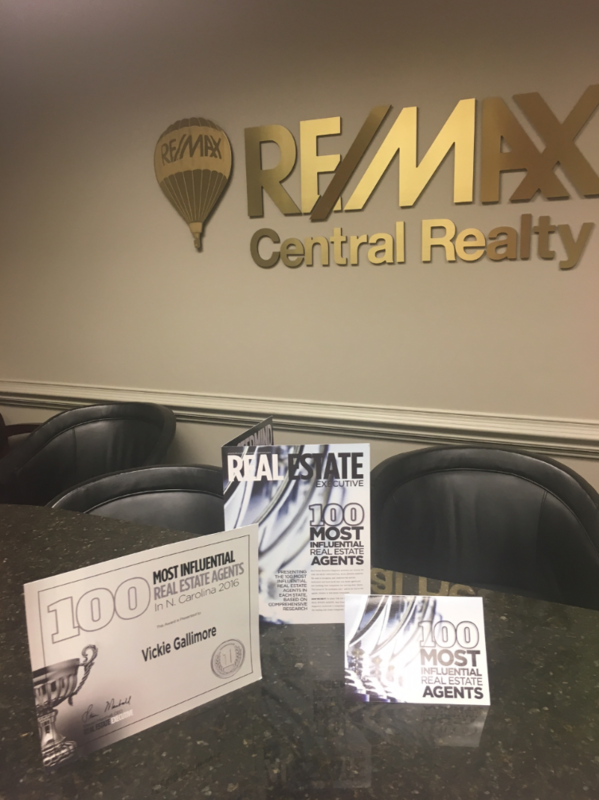 Vickie is proud to count herself among the Top 20 Commercial Teams in the United States and is proud to be counted among a select group of realtors in the NJAR Distinguished Sales Club. Vickie, a high achiever and lifelong student, has earned many real estate credentials. Her passion for real estate and dedication to learning are invaluable in her success as a top Randolph County Realtor. As a top Randolph County Realtor, Vickie works closely with her clients. Vickie strives to understand and meet all of her client's real estate needs and goals. If you are considering buying or selling in Randolph County, contact Vickie Gallimore to learn more about how Vickie can help you in your next move!